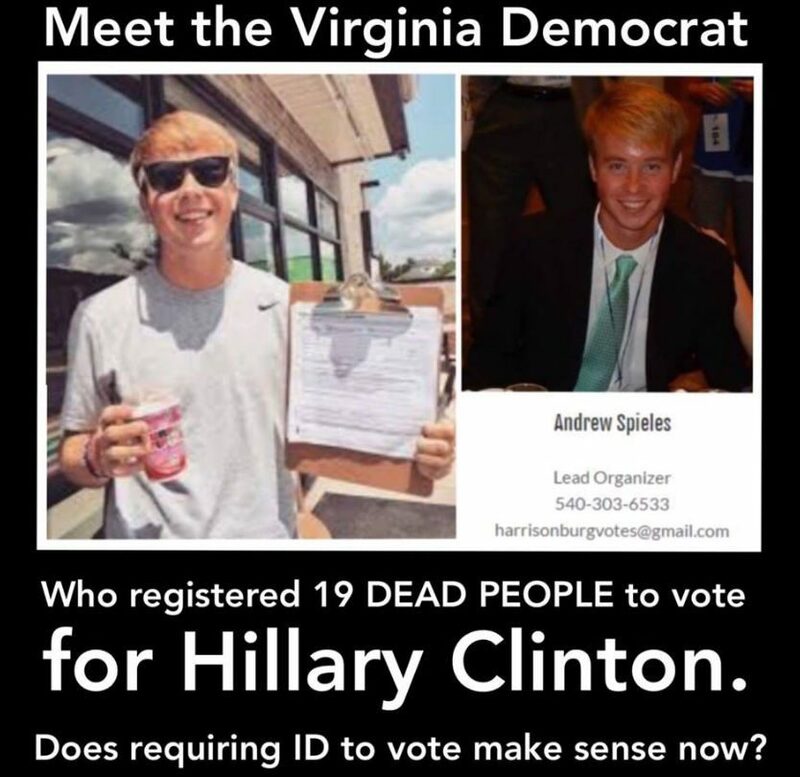 A Virginia student reportedly registered 19 deceased Virginians with the intent of using their identities to cast votes for Hillary Clinton. While images like the one displayed above are based on a investigation taking place in Virginia, they also promulgate several unsubstantiated claims and unofficial pieces of information. As of this writing, no one has been charged with any crimes in connection with the reported story. A JMU student allegedly committed voter fraud recently using the identities of deceased people while working to register voters through HarrisonburgVOTES. The suspect worked for this organization for about nine weeks while he allegedly submitted both legitimate and fraudulent voter registration forms. HarrisonburgVOTES isn’t involved in this case. While The Breeze has identified this student, it has chosen to withhold any identifying information until a charge occurs. HarrisonburgVOTES is a non-partisan voter registration organization in Harrisonburg, VA and the surrounding areas. The sole goal of HarrisonburgVOTES is to increase the number of registered voters in Harrisonburg and the surrounding areas to increase and encourage civic engagement. Republican lawmakers held a news conference call to call attention to the investigation, which they said proves voter fraud is real and validates their push for strong voter ID laws. Del. Marcus B. Simon, D-Fairfax, said it’s “very disingenuous” to suggest the applications were part of a large-scale fraud, because votes would have to be cast either in person by elderly impostors or through absentee ballots sent to real home addresses. “There’s no way any reasonable person could conclude that this was part of an effort to actually cast votes for people that aren’t able to cast votes,” Simon said. Richmond Times-Dispatch. 29 September 2016. The Breeze. 15 September 2016. Daily News-Record. 15 September 2016.